The scene is set for the incredibly dramatic events that take Jesus to the cross and the tomb, and to His glorious resurrection. If you ever get the opportunity to see a good Passion Play, it is an experience you will always treasure. My daughter and I were privileged to see the play in Oberammergau, Germany, in 2000. We went with my son and his wife. It brought the events of that week to life in a whole new way, and I’m so thankful we were able to be there. Jesus had such pity for people that He actually suffered with them in their pain. He had compassion on all of us, didn’t He? This beautiful picture of Jesus simply touching the eyes that He had created is evocative of the personal, intimate way in which He wishes to interact with each one of us. He wants healing for us in more than our physical needs; He wants to heal our sinful souls, and take us to live with Him forever in heaven. I love it that the two healed men immediately followed Him. No hesitation. 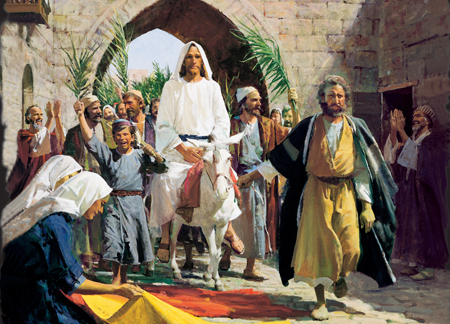 During most of His ministry, Jesus was active. He walked miles and miles. He healed, fed, and ministered to thousands of people. He taught, speaking from the Old Testament scriptures. He debated seldom, because His answers usually silenced His opposition. He rode out storms, walked on water, cast out demons, stilled the wind and the rain, raised loved ones from death, visited with the throngs, comforted the grieving. And He occassionally went off by Himself to rest, and to pray. Seldom did He simply stand still. The crowds must have been pressing in on Him. Hot, sweaty, demanding, and curious to see what He would do next, they didn’t want to be slowed down by a couple of lowly blind beggars. BUT! Jesus. Stood. Still. Not for a king, a prince, a high priest, or a Roman centurion, but for two blind men whose faith was so great that they recognized Him and cried out to Him, in spite of the efforts of the crowd to hush them up. You know, I’m just a nobody. When I die, some will remember for a while, but not for long. I’ve read that most of us pass into oblivion in the world’s memories in about 60 years. And yet, when I cry out to my God, do you know what happens? He Stands Still–for ME! He listens, He heals, He comforts, He speaks to me through His Word and gives me what He knows I need. He ignores the noisy crowd who want something else from Him, and He ministers to my need. That’s the kind of God I serve: One Who will stand still when He hears me cry out to Him; One Who loves me in spite of my insignificance in the world’s eyes, because in His eyes I am significant indeed. 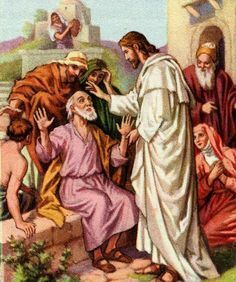 I believe it is safe to assume that it was the Holy Spirit Who touched the hearts of these two blind men, leading them to recognize Who Jesus was. It is interesting, then, that the great crowds who followed Him were apparently not of the same mind, or the same degree of faith; otherwise, they would not have rebuked the blind men and tried to keep them out of the way. Apparently the crowd did not share the blind men’s faith the this was indeed the Son of David, Messiah, He Who had come as the Anointed One to redeem Israel and all sinners from the result of their sin. There are great crowds today who “follow Jesus.” I even read recently about the publishing of a gay-friendly version of the Bible, which by its very nature must have had to omit several important passages. President Obama himself once claimed he was a Christian, but all of his words and behavior since then have pointed in a different direction. Matthew 7:21-23 makes it clear that in the final judgment, there will be many who have claimed Christ, but that He, Who knows our hearts, will send away because He never knew them. You can read my post about this passage here. The lesson for us today is that it can be very dangerous to follow the crowd. Of course, that is not the only thing that can be pulled out of this passage. But for me, today, this morning as I study and write, that’s the thing that speaks to me. It is dangerous to follow anyone other than Jesus. It is dangerous to become enamoured of a man or a woman and to honor that person’s words and writings above the Word of God. There is a lot being written today that true believers need to sift through the Word. There is more being said from pulpits, and from TV and radio microphones, that we need to hear with great discernment and not follow simply because everyone else is. Jesus certainly did not follow the crowd, as we’ll see tomorrow. 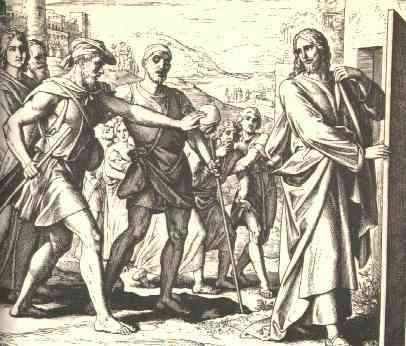 How do you suppose those two blind men knew that Jesus was the Lord, the Son of David? 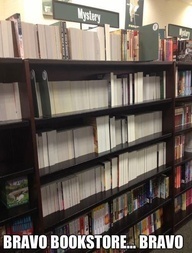 They couldn’t read, after all. Clearly they had some education, though, and had listened to the Law and the Prophets being read. Clearly they understood Who Jesus was, though their eyes could not see Him. In simple faith, they called to Him for mercy, believing fully that He was the Son of David, the Son of God. Wouldn’t you love to have been there?